Are you a photographer Looking for the best memory card reader on the market? More importantly, are you having issues transferring images directly from the camera? For quick and to the point answers, take a look at my review of the Lexar Professional USB 3.0 Dual-Slot Reader and find out if it meets your requirements. Is this the memory card reader for you? After owning the Lexar Professional USB 3.0 Dual-Slot Reader for almost a year, I can unequivocally state that I would definitely purchase this memory card reader again. When asked about this reader, my initial thoughts are fast and reliable. Despite the fact that I’ve already let the cat of the bag on my opinion of this card reader, let’s get down to the brass tacks. Is this the card reader for you? Take a moment a check out the main points below and find out if the Lexar Professional has what you’re looking for. Data transfer rates on USB 3.0 can reach up to 500 MB per second. Additionally, it’s important to know that the card reader functions on computers with USB 2.0; however, it’s equally important to understand that speeds can be up to 5 times slower. Supports CompactFlash (CF) including UDMA 7 (Ultra Direct Mode Access 7), and SanDisk (SD), SDHC, SDXC, and SD UHS-I and UHS-II cards. Read speed is 150 MB per second max when used with a CF 1000x cards. The reader has two slots accepting both SD and CF at the same time. Additionally, one can use the SD slot for a micro SD with the utilization of a memory card adapter. A Blue LED light informs you when the file transfer is complete. The body has a pop-up feature for protecting the card slot pins when not in use. Weights 3.8 ounces with the USB cable included. USB cable length is 3.5 feet. Is this a must-have item? The real question is whether you can live without it or not. The answer depends on your unique situation. Although one may want it for its convenience, another may need it for its fast performance; In any case, it mainly boils down to the intended purpose. Performing a task is one concern, however, performing it well is another altogether. With that in mind, I decided on the Lexar Professional USB 3.0 Dual-Slot Reader mainly for reliable performance; although, speed and price were also important considerations. Although I enjoy technical jargon, bottom line, this reader is a well-oiled machine! Speaking from the perspective of a photographer, when compared to transferring 200 RAW files directly from my Nikon D800 to my MacBook, there’s no question which is faster and more reliable, the Lexar wins every time. 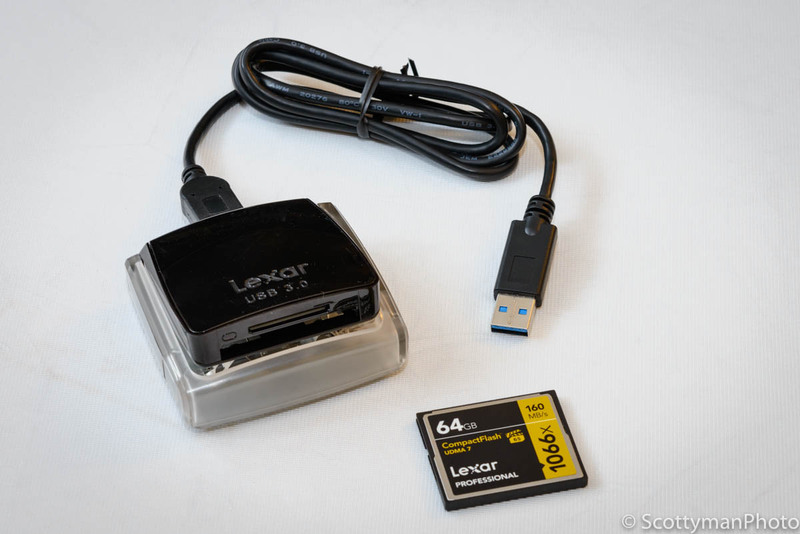 Forget the transfer speed technical minutiae for a moment; before using the Lexar Professional USB 3.0 Dual-Slot Reader, I routinely experienced file transfer delays as well as the occasional system lockup. Consequently, after switching to the Lexar Professional, I’ve experienced, fast, reliable, and hassle-free file transfers. With that said, I wanted maximum performance; hence, I use Lexar Professional 1066x CF cards with this reader. As a result, the speed is phenomenal, and I’m yet to experience a single freeze up. Also noteworthy, I use SanDisk high-capacity cards achieving similar results. Is it travel-friendly as well as durable? Lightweight and constructed of durable plastic, the Lexar Professional USB 3.0 Dual-Slot Reader is one sturdy piece of gear. Also, the 3.5 foot USB cable is detachable from reader body, which in my opinion, offers increased flexibility while traveling; thus, this feature provides a convenient way to stash it in a travel bag or checked luggage without concerns of damaging the memory card reader receptacle. Not to mention, a detachable USB cable affords the opportunity to use different length cords if desired. What’s the cost versus price? Primarily, the answer to this question depends on the user’s needs; however, as a photographer, I calculate the price I’m willing to pay, by what it will cost me in the long run, particularly in time! Post processing a large RAW file is not the most difficult task, but it can take precious time. Therefore, In contrast to time, the $33 I paid for this reader was a sound investment! Fast, reliable, and travel-friendly, the Lexar Professional USB 3.0 Dual-Slot Reader, does NOT disappoint! Priced around $30 or $40, it’s a solid deal, and well worth the investment. If my reader failed today, I would immediately order the same one.